La Marmotte 2008 – Success! 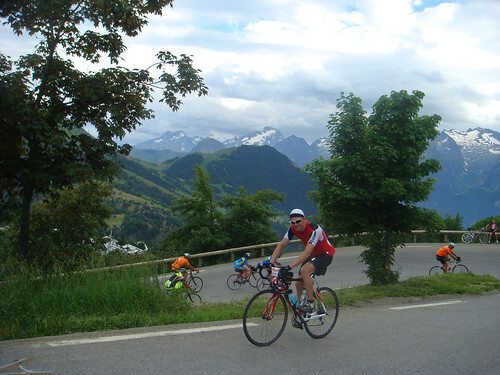 You are at:Home»Cyclosportives»La Marmotte 2008 – Success! We may not be fast, but we are determined. The biggest ride of our lives by far! Wow! Yesterday, Martin and I rode La Marmotte. 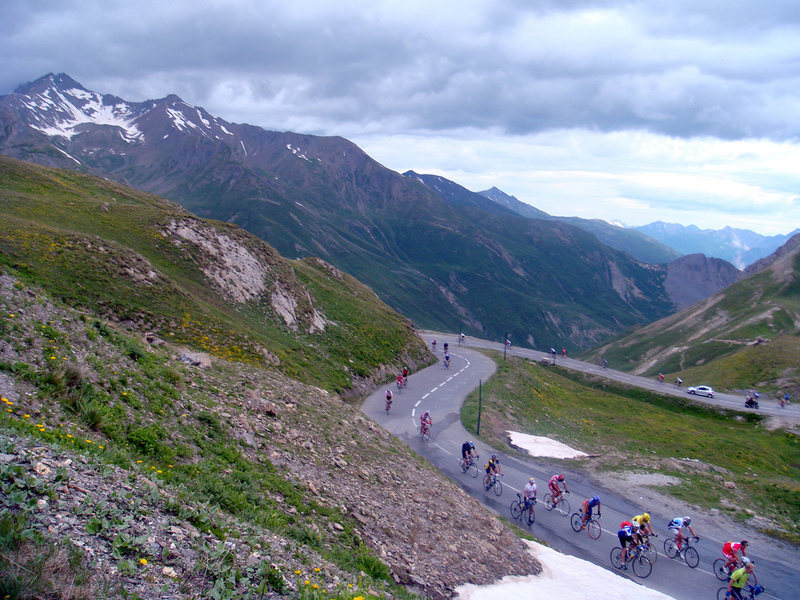 Along with “L’Etape du Tour” – it is probably the most famous – and one of the the most challenging – Cyclosportive in France. 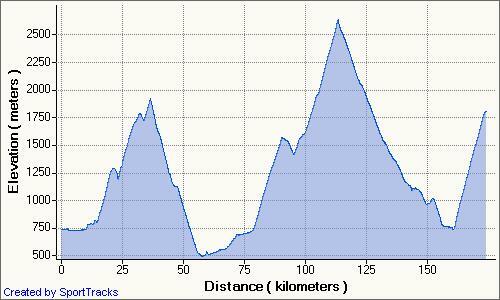 174 kilometres (108 miles) and 5,000 metres vertical ascent (16,400 feet)! 8,000 riders (!!) 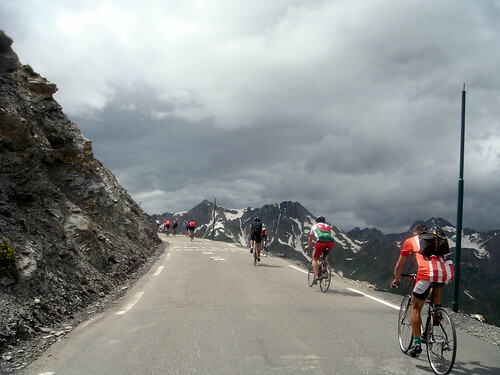 and a route that included three legendary hors category climbs – Col de la Croix Fer/Glandon, Col du Galibier via Télégraphe, and Alpe d’Huez. See here for a review and map of the route. Anyone looking for the official results, they are now posted here. If you were in the race, photos can be purchased here and here. Here’s a brief video of our adventures and then a slide show. We started near the back, and delays and 8,000 riders meant we shivered at the start for almost an hour after the 7am start time. Perfect weather to start the ride and it clouded over for some shade later in the day. This is a truly international event and I met far more Dutch (everywhere! ), Belgium, Italian and UK riders than French. Climbing the beautiful Col de la Croix de Fer was a crowded affair. Cyclists everywhere – but superb! The top of Glandon (the route skipped the last 2 kms of Croix de Fer) was a zoo. Getting food and water was hard work but everyone was in great spirits. After a hair-raising 20 kilometre decsent and 25 slightly uphill kilometres in the Maurienne valley, we attacked (?!) 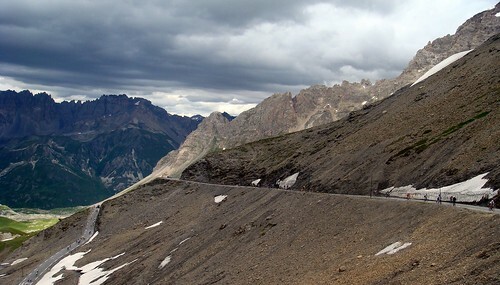 Galibier. It is such a beautiful and epic climb. From Plan Lachat, the last 9 kilometres literally go over the Alps. It was cold up top but the last 45 minutes was just an amazing ride. While climbing Galibier we heard a Marmotte giving it’s distinct warning screech. A propos! The worst part of the day for me was definitely the 45 kilometre descent to Bourg d’Oisans. It was cold, long, 10 tunnels, some cars, etc. Like down Glandon, several hundred people passed me on the descent and Martin was very nice to wait for me. But after 2,000 metres of vertical descent, the weather changed from freezing with snow beside the road to a heat-wave. Climbing Alps d’Huez I felt (surprisingly) great. And I was really excited that I would actually finish. We passed maybe a couple of hundred riders up the hill, some walking, many slouched at one of the hairpins (the strong riders had finished hours ahead of us). But most determined to finish. Overall, I had far more fun than I expected and it hurt a little less than feared. Epic! Well done guys; BIG effort. Looks like a classic Slogfest. But whats this? Some sort of video comedy-duo routine developing? Wow, wow, wow — what an accomplishment. Succeeding at the full Marmotte deserves a Chapeau!! 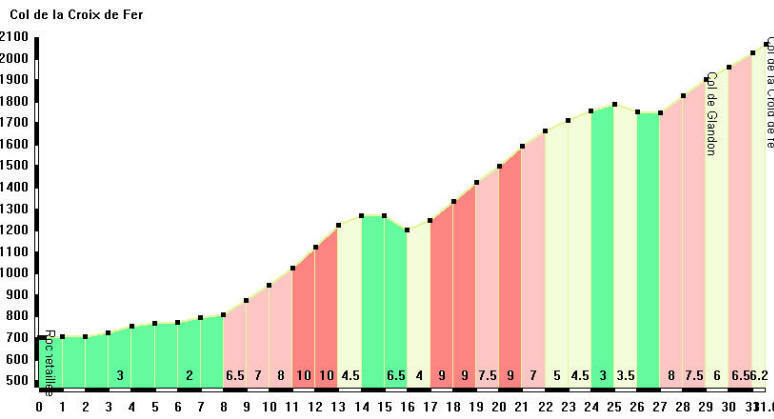 I can’t believe what a day you had yesterday — I remember when doing that course as 3 climbs over 3 completely separate (and non-consecutive) days would be have been seen as big days in their own right. To do all that in one day is just mind-boggling. You kept saying you were ‘only’ going to do part of the course, but a little part of me doubted…a feeling confirmed when I received your text last night that you and Martin were now full members of the Marmotte brotherhood! These are laurels you can rest on for the rest of your life……well, at least the next couple of weeks until the Tour d’Enfer!!! Congratulations on a great ride, Will. Outstanding accomplishment. I was just taking to my brother about these very climbs yesterday. A mutual friend suggested his dream trip must include the fabled Belgian pave. 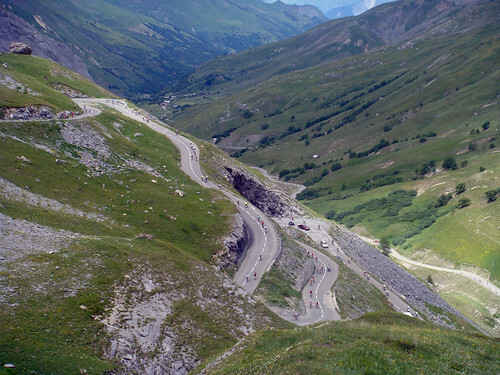 We both agreed the classic cols you climbed here are far and away the better choices. And you did them in one day only. Bravo! Congratulations from Canada!! I was in Ottawa for the w/e. Tell Martin the streets were closed for cyclists. Very flat by the canal!! But the jazz was good. Freakin’ Fantastic… and a HUGE CONGRATS to you and Martin!!! Once again you have wowed us with fun video and breathtaking pictures. I really have to get to Euruope soon. The local Tourism board should hire you. By the way… I hope you had a very large beer to celebrate. Dutchmen everywhere as you said, so even here. I finished just within 12 hours, with also well over an hour of non-moving time. Funny that my best part of the day was your worst: I was in total ecstasy during the descent of the Galibier and Lauteret. For me the secret of finishing (despite my total lack of mountain cycling experience) was to keep my heartrate under a certain level (in my case 160bpm) And besides that eating and drinking like a pig, both manner and quantity. Wow! Nice one Will. Congratulations. Oh and the scenery is gorgeous! You are insane! Congratulations – you are the most goal oriented person I know. I am blown away by what you are able to acheive little brother! I am so proud of you. Thanks for such a great collection of photos and the write up – my only pictures were badly taken on my mobile phone, so these are a great souvenir. I hadn’t ridden on any real mountains before (the Dragon Ride, I now know, doesn’t count) so I rode it to get round and didn’t have my eye too closely on the time. I was the toughest and the best thing I’ve ever done sports-wise and an excellent incentive to drop 20lbs and challenge it properly next year. Massive respect for anyone that completed the course (including me) but those Gold standard riders… wow. 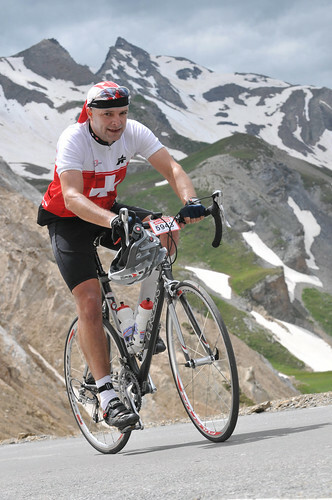 I’ve finished 5 L’Etapes, but cracked on La Marmotte in 2007. Go for L’Etape. It’s a logistical nightmare, but every cyclist should do at least one. Amazing! Congrats Will! This is the same loop I’ll be doing in one week, but luckily, I’ll be doing it backwards from the way you’re doing it. I think I have it MUCH easier. Climbing all these in 1 day is certainly epic. Congratulations! 1) My CALF HURTS… Please, we really feel soooo sorry for you. How long has this been going on now? Since our Col du Sac ride in March??? And what have you been doing since??? Riding farther and higher and farther and higher. Leave the load of BS home and you will even ride faster up those mountains. 2) So you feel you are a poor descender???. Another load you better leave home next ride, even tough extra weight helps on the descends. Katy and I descended Glandon on Tuesday on the tandem (which is great for that type of exercise), but it was tough. Bad road surface, many tight turns with little visibility and steep (at least the top part). And you think it is fun to come down there together with another 7998 unknown cyclists Yes, I consider that you can trust Martin :-). Beware though as if you keep riding on like this you may be bored on the upcoming Tour d’Enfer. 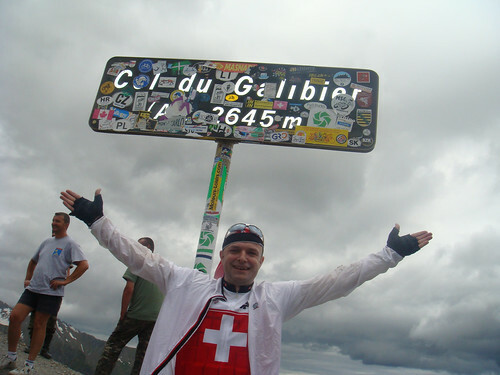 Galibier? Done that! Joux Plane? What a bore! Col du Colombier? Oh no, not that little hill again! OK, I admit, CONGRATULATIONS on the achievement to both of you. I hope we can go for another ride soon and that I can follow you guys. A question! Is it possible to link my website?